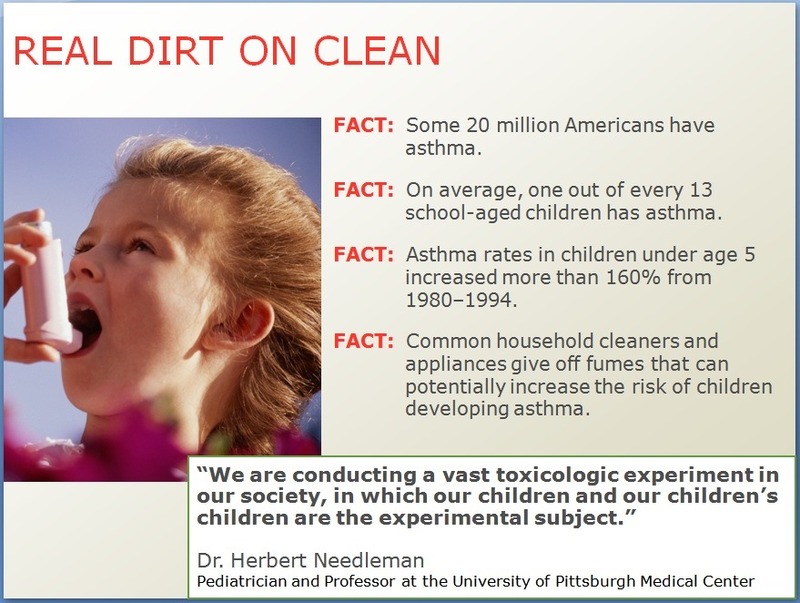 Clean, Protect Your Children, Reduce Asthma, Save Money! Asthma rates increased 160% in children from 1980-1994 and have continued to increase since. One culprit is the many, toxic, household cleaners we use in our homes. In the past 7 years, since I changed to non-toxic cleaners like the one below and began making healthier nutrition choices, I’ve need my asthma medication for a total of 1 week as opposed to daily prior to that time. The non-toxic argument is why I began using it… The AMAZING results and myriad of jobs it can do with the tiniest amounts has kept me hooked on this great cleaner! This product is used in the White House, by Jacque Cousteau on his fleets, by Purdue University in their Dairy Operation, and many others! It is a safe alternative that works while keeping our homes safe from toxins and poisons. Economical – ½ Gal makes up to 192 gallons of powerful cleaner see cost comparison below. 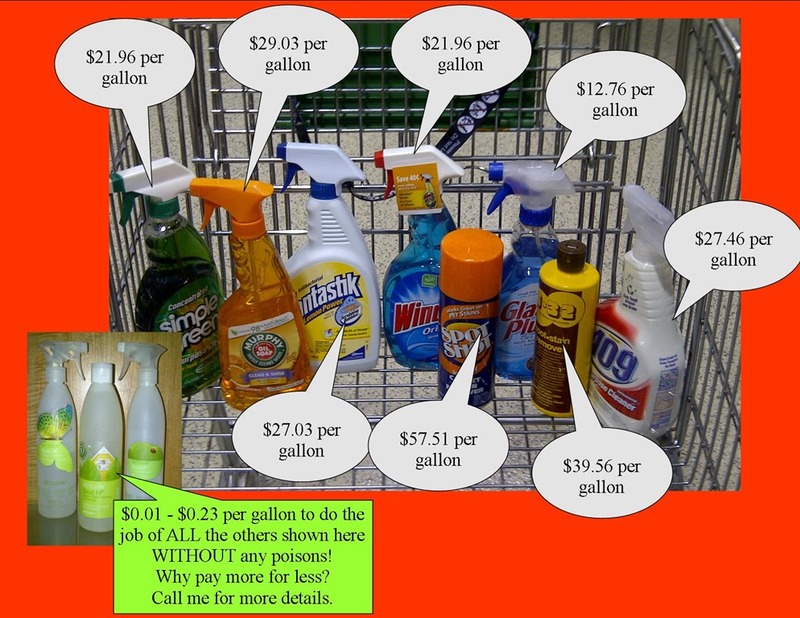 General Spray Cleaner – For Only 3 Cents per 22 oz bottle! Mix – 1/4 tsp. in 16 oz spray bottle of water. General Cleaning – 1/2 tsp. in qt. of warm water. Cleans doors, walls, woodwork, appliances, bathroom fixtures & tile. Floors – 1 Tbs. per gallon of water. Leaves floor shining. May require rinsing. Dusting – 1/8 tsp. in pint of water, squeeze sponge almost dry (or spray on). Wipe off dust, fingerprints, etc. Dry with clean cloth. It leaves the wax finish beautifully bright. Surfaces repel dust, so less dusting is required. Outside Windows – 1/2 tsp. in "Ortho-type" spray applicator full of water. Makes 2 gallons of solution for windows & screens. Squeegee dry. Coffee-makers – Dilute 1/8 tsp. Basic-H² in pot of water. Run through cycle & coffee stains will rinse away. Ironing – 1 drop in steam iron keeps the jets & interior clean. Wallpaper – Excellent for removing wallpaper. 1/2 Tbs. per gal. of water. Soak wallpaper with sponge & peel or scrape. Concrete & Mortar Mix – 1/4 oz. per 1 gallon of water. Makes cement & mortar spread easier & smoother, set harder. Plumbing – Will keep pipes clean & free-running when used regularly to wash hands, pots & pans at sinks. It emulsifies grease & can eliminate cleaning of grease traps. Pressure Washer – 1/2 oz Basic-H² to 20 gallons of water. Heavy Duty – Use 1 oz per gallon of water. Leaves a luster to mobile homes, homes, RVs & etc. Humidifiers – Use 1 or 2 drops in humidifier water to help prevent rust & scum. Knives – 1 or 2 drops on cutting stone for sharpening knives. Keep moist & add Basic-H² as needed. Doesn’t clog stone–very important when sharpening tools. Stone rinses free of residue. Yard Spray to Rid Fleas – Fill hose spray bottle with water, add 1 capful of Basic-H². Attach to hose & spray yard every 10 days for 3 applications. Use twice a year thereafter to control. Rinse all plants thoroughly. Liquid Hand Soap – Mix 1/4 Basic-H² & 3/4 water in pump dispenser by sinks. Will not dry or irritate hands like soaps may. Will help moisten, soften & protect hands! Fine Fabrics – Use 1/2 tsp to a basin of lukewarm water to wash woolens, nylon stockings, and all fine fabrics. Gum – Use full strength to remove gum from skin, hair, or carpeting. Fruits & Vegetables – Use 1/8 tsp. in pint of water, soak up to 7 min, and rinse. Removes insecticide residue, dirt, and waxes. Automotive Uses – Washing vehicle use 1/2 tsp. per gallon of water. Wash small area at a time and hose off. Wipe windshield, windows and chrome with paper towels or microfiber cloth after rinsing. You’ll love the shine! Camping – Coat bottoms and sides of pots and pans with Basic-H² before placing over campfire. Black soot just slides right off when you wash. Basic-H² is all you need to take for dishwashing, bathing, shampooing, and laundry. It even works in cold stream water, and because it’s organic and biodegradable, it won’t harm fish, vegetation, or wildlife! works wonders on boats, docks. Crayon – To remove from walls, use full strength. Spot Remover – Dampen spotted area with water, and apply full strength. Use a toothbrush or finger to rub basic-H² into area. Wipe with a damp cloth or rinse in basin of water. Septic Tanks – Keeps crust from forming. For maximum health of septic system use all of Shaklee’s phosphate free cleaning products. This will do much to promote the growth of needed friendly bacteria. LEGAL STUFF SHAKLEE MUST SAY: Some plastics may be sensitive to the cleaning agents in Basic-H². washing, Shaklee does not recommend the product for personal care. An eye irritant, Basic-H² should not be used to clean contact lenses, plastic-forward lenses, or plastic-glass frames. Because of risk of irritation, particularly among young females, Basic-H² should not be used as a bath additive in any amount, even when diluted. Bath additives require special testing, which has not been conducted on Basic-H². For the same reason, Basic-H² should not be used as a general shampoo or dandruff shampoo. Do not mix Basic-H² with Basic-G Cleaner. The water wetting agents in Basic-H² inactivate the germ-killing agents in Basic-G. In case of eye contact, flush with water, as Basic-H² is highly concentrated. This Information is neither sponsored nor endorsed by Shaklee U.S., Inc. – This information has been provided by users of the product for 14-30+ years of the product. ← Previous Post ###-FREE does NOT == HEALTHY!